And so it begins. Yet another Summer of Comic Book Movies kicks off with the current King of the Heap franchise giving us a potentially record breaking weekend – in fact one that will largely be seen as a disappointment if it doesn't deliver just that. Avengers: Age of Ultron is the second film to collect all of Marvel's big properties in one giant package, a somewhat less riskier proposition than the first time this was tried three years ago. Merging four franchises (plus miscellany) had never been tried before, and just attempting to launch all of these properties was difficult enough and met with varying rates of success. In the process, Marvel ended up starting an entirely new way of cross-platform entertainment and creating their own empire. This was largely possible thanks to the eye-popping $207 million it collected in its first weekend, its $621 million domestic figure and a $1.5 billion dollar take worldwide. The Marvel Cinematic Universe hit big time after that, with TV series popping up all over the place to take advantage of super hero fever. With dozens of ready-made franchises, it was almost as equally important for what it allowed as what it earned by itself. In the second go-round, the lead-up films have all been much more successful, including the out-of-nowhere success (I attribute it to mass ergot-poisoning) of Guardians of the Galaxy late last summer. The question then is, can this translate into a likewise increase in the take for the latest Avengers film? I've barely even spoken about the plot of this film yet, so far as it matters, but here we go – a murderous A.I. Named Ultron (voiced by James Spader) and a by-product of Stark Industries (I mean, this guy – when will he stop causing problems he has to clean up?) is set to remake the world in his own malevolent image, with the help of sentinels trying to destroy any organic lifeforms that stand in his way. Cue the Avengers for a world-spanning battle and lather, rinse repeat. There's some notable other touchstones for fans like VISION and the Hulkbuster armor, but I don't see those driving business that much. 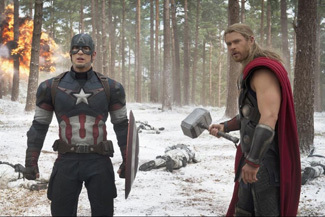 Part of the build-up of The Avengers was its novelty, and its position as a culmination of years of story-telling. The films in Phase Two, as this group has been called, feel much more disjointed from each other, making the marquee property less monumental. It's a strange complaint to make – that the better film-making of the individual films has come at a sacrifice of the event feeling for this one. Still, there's almost an obligation to see The Avengers films for comic fans, and it's not as if this looks bad, just not as special. International box office has already set records, but the past three years has seen an explosion in that realm (Furious 7 has already earned $1 billion internationally, leaving NA completely out of the mix), so it's hard to say if that's a telltale sign or not.